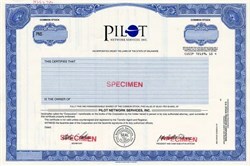 Beautifully engraved certificate from the Pilot Network Services, Inc. This historic document was printed by the American Banknote Company and has an ornate border around it with a vignette of the company name and logo. This item has the printed signatures of the Company’s President, and Secretary,. Pilot Network Services, Inc. is a leading provider of advanced Internet security for business. Pilot is the first Secure ISP and offers Internet security services, including secure Internet connectivity; Secure Telecommuting; secure Web, FTP, and News Hosting services; user authentication and encryption; and Corporate Partner Privacy.